The Calphalon Signature Nonstick 2-Quart Sauce Pan with Cover is made with a Sear Nonstick surface that evenly sears, browns, saute and seals in juices when cooking meats, seafood and vegetables. This nonstick cookware surface is so durable that you can cook with metal spatulas, spoons and whisks, and it's also dishwasher safe for easy cleanup. Now, you can have it all - a metal utensil-safe nonstick that sears just like stainless. The medium 2-quart Sauce Pan is a true essential - you'll reach for it over and over again. Use it to make soups, sauces, pasta, rice and more. 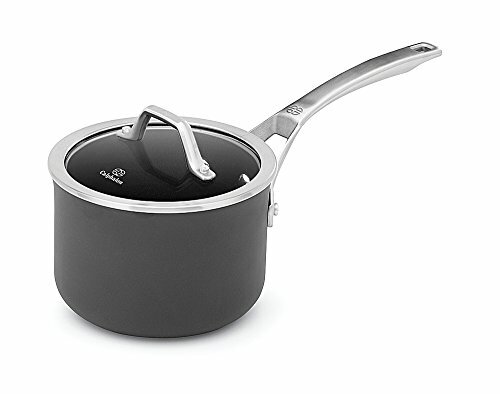 With high sides and rounded corners for easy stirring, it's finished with a beautiful brushed stainless steel handle.